This restoration was generously sponsored by Gary Tigges. 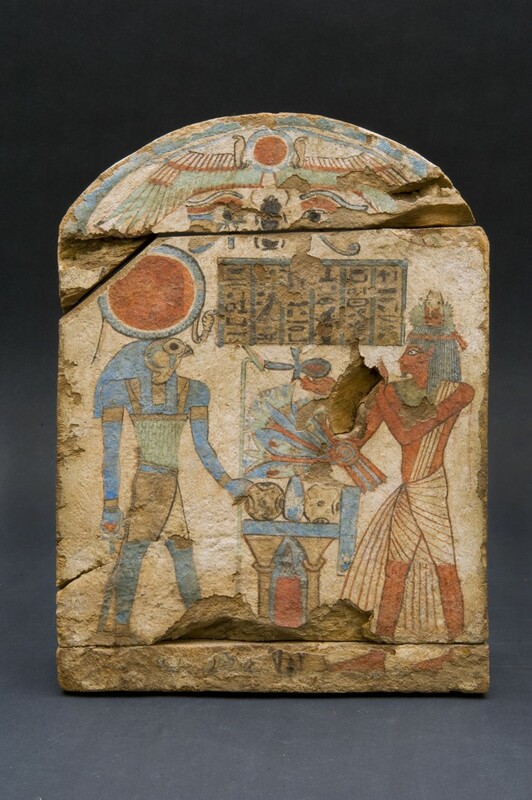 This ancient wooden grave stele belongs to the Third Intermediate Period (1070-712 B.C.) and is beautifully decorated with painted bands. The decoration shows a portrait of a dead man, the “Third Prophet of Karnak”, offering a flower bouquet to the god Ra-Harakhte (represented with the head of a falcon). The Prophet of Karnak is in front of an offering table and in Ra-Harakte’s left hand is a scepter (symbol of stability), while in his right hand he is holding the ankh sign (the symbol of life). On his head there is the solar disk with ureus, the cobra. Depicted on the top of the stele is another solar disk with two winged snakes. This stele is composed by three pieces of wood: the body of the stele is the largest portion in the centre, the upper rounded part and the bottom part shaped like a rectangle. The x-ray showed that these pieces were connected to each other with six wooden-nails: three on the top and three on the bottom. The first steps of the restoration consisted in a pesticide treatment followed by an accurate consolidation and cleaning of the wood which was affected by several fissures and holes. Special attention was given to a large fissure located close to the left foot of the god. Later, the restorers cleaned the whole pictorial surface and proceeded with the touch-up of colors where necessary, affixing the outer layers, including the painted and inlayed decorations with the help of synthethis resin. Unfortunately, the bottom part of the stele is darkened if compared with the rest of the piece. This was possibly due to a substance which affected this area of the stele. The restoration process revealed that this wood is a figue wood (ficus Sycomorus) and that the whole surface of the stele is covered with two layers of color: the first beige and the second white. The beige layer helped the artist not only to paint the scene but also to create a flat surface by filling up the natural fissures and gaps of the wood. Due to the restorers methodical and precise cleaning, our team discovered that the pictures which compose the scene were first drawn with red pigment followed by black to underline the facial features, inscription, and the dress of the god. The palette of the painter who took care of the decoration was extremely rich as it is common in Egyptian funerary decorations: two different greens, blue, brown, black and red.